Archive for "Mt. Washington Cog Railway"
As I planned a trip to the New England area, visiting the White Mountains in New Hampshire was high on my list of priorities. All the travel guides I read suggested that a ride on the Mt. Washington Cog Railway was a must-see. 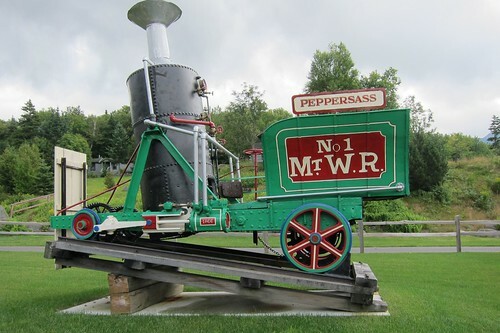 The original steam engine, Peppersass (above), and other steam and diesel engines are on display at Mansfield Station where the ride begins. Info from the Mt. Washington Cog Railway website: “The beauty of the mountains and the thrill of ascending the Northeast’s highest peak are just as enchanting today as they were in 1869, when Sylvester Marsh opened the world’s first mountain-climbing railroad on New Hampshire’s Mount Washington. 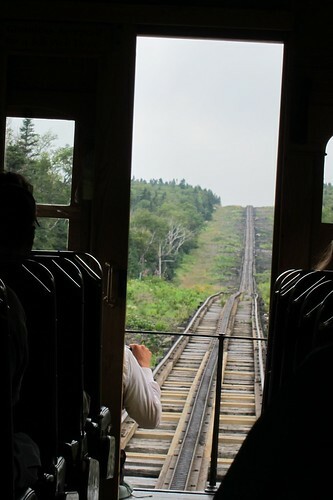 Nearly 150 years later, the Mount Washington Cog Railway continues to provide a sense of adventure and history as it carries passengers up a 3-mile-long trestle and the steepest railroad tracks in North America to the 6,288-foot summit of Mount Washington. 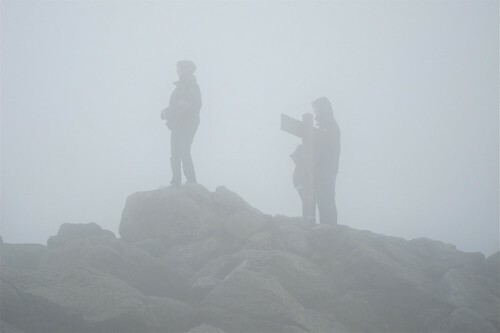 Well, the website didn’t mention that the mountain is often fogged in, that visibility is very limited (as you can see in the photo below), and that it can be quite cold. However, the adventure of the ride up and down the mountain on the railway does make the trip worthwhile, even if the view at the top is fogged in. You can always drink hot chocolate in their snack bar as my friend Doris and I did! For addition info on Mt. Washington Cog Railway, go to http://www.thecog.com. To view a slideshow of our trip on Mt. Washington Cog Railway ride, click on any photo. If info about the photos is not displayed in the slideshow, click Show Info. This photo of the tracks was taken from inside the railway car in which we were riding.